A paper route was my very first job as a kid, starting in 6th grade. The thing I got up so early in the morning for? 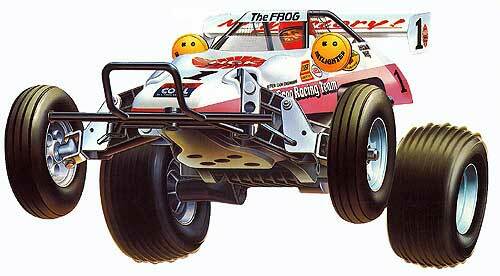 A 1/10 scale RC car called The Frog, by Tamiya. A couple of friends and I saved up for months to buy these cars (Eric had The Hornet, and Steve had The Ultima) and we tinkered and raced and loved them. Putting them together was part of the process – The Frog came as a big box of parts and a book on how to assemble. I have no idea what became of my old beloved Frog. I suppose I grew out of it and left it behind when I went off to college. Nostalgia. How excited was I when I heard that Tamiya had reissued The Frog (and a few other models like The Hornet)? Well I was even more excited when Eric sent me an entire Frog kit – with the radio, battery, and charger too! Indeed this is pure Nostalgia. I was myself owner of the \”Fox\”. How rad is that? I remember getting the Ultima for my birthday and being super excited, while my friend got the Hornet. That was back in the days when you had to assemble your car unlike now days where the RC cars are already put together. For awhile I got into the gas powered RC cars made by Traxxas but they were constant maintenance and the excitement just wasn\’t there like it used to be. Now I just excited about new web design practices like responsive design which led me to this site. Great job by the way! Really well done.